I had Rickie’s pillow at my house for a good two months before this photo was taken. I gave her many reasons for the delay, my camera battery was dead, I didn’t get home in time to catch the good light, I needed to change my bedding, it was raining…the list goes on and on. The truth is, every time I looked at the pillow it made me smile, I didn’t want to give it back! To create this charming pillow Rickie started with our Olympus Sashiko Sampler, White Hana-Zashi, but when it came to choosing thread she decided to forgo tradition (which would call for navy blue) and instead used 6 cheerful and vibrant colors. 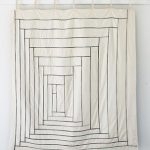 She framed the finished stitching in a pillowcase of Tencel Linen from Robert Kauffman and closed it up with a 12-inch, Turquoise non-separating nylon zipper. Before she got started, Rickie checked out Mari’s Sashiko Tutorial. She followed Mari’s tutorial starting at the bottom right corner of the sampler and followed the curvey lines with one color to the next corner. 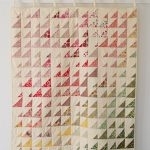 She stitched the next curvy line with another color, and then another, and another, and another…you get the idea. Once Rickie finished her stitching, she cut 1 1/2-inch strips from the Tencel Linen and made a frame around all 4 sides of the sampler using a 1/4-inch seam allowance. Then she cut a 14 1/2-inch square of Tencel Linen for the back of the pillow. Following directions from Mari’s Bias Tape Purse with Zipper, she sewed in her zipper and then and sewed the pillow case closed with a 1/4-inch seam allowance. I love this pillow! Could it be more beautiful? This is such a happy pillow! I love it! Beautiful job Rickie… I can see why Jen wanted to keep it around! love the color combined with the geometry. my inner craft-nerd is rejoicing! WOW. this is so gorgeous… so original and simple. i love it. so beautiful, unique and fresh! This pillow is so striking. frustration ! you have 0 in stock of the kit. and they’ll let you know. It reminds me of the designs I used to make with Spirograph!!!! Gee, there’s a thought………….. LOVE the choice of colors, thanks for sharing! This is beautiful!! Do you know if you can use regular DMC floss? 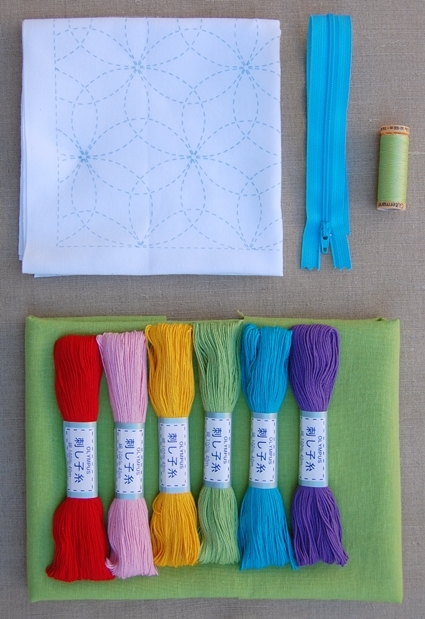 Or do you have to use Sashiko thread? Sashiko thread is a little thicker than floss, and it’s matte which makes crisp stitches, but you can use any kine of embroidery thread. This is so amazingly beautiful! I will definitely have to give this project a go. My lounge suite is looking rather bare at the moment and this will be perfect for it. i love it! i can see why you delayed. who could blame you? really??? I am very proud of my granddaughter and when we visited with her recently she showed me this pillow. It is very pretty and goes with the decor of her room. What more can I say except that she takes after her grandma. I love the look of sashiko, but it’s not the style of my home at all…I never thought to do it in such colors! DUH! I love that pillow…thank you, thank you, thank you! I am so so proud of my niece. She is so talented and smart and inventive. This pillow is so beautiful. I don’t think I could ever of had the patience that it took to make this beautiful pillow. She takes after her Grandma. I think this is really pretty Rickie. I am proud of you. I think it would look great in my room now. I love you. I do understand why you have such a hard time giving that pillow away. It is just so sweet. I havn’t seen it in navynblue, but I could also imagine that it would be nice. And then just a compliment to your blog. Very inspiring. I absolutely LOVE this pillow … the color circles are great! 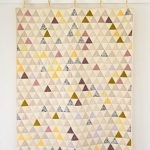 Do you know how many Sashiko threads I would need if I wanted to do this all in the same colour ? 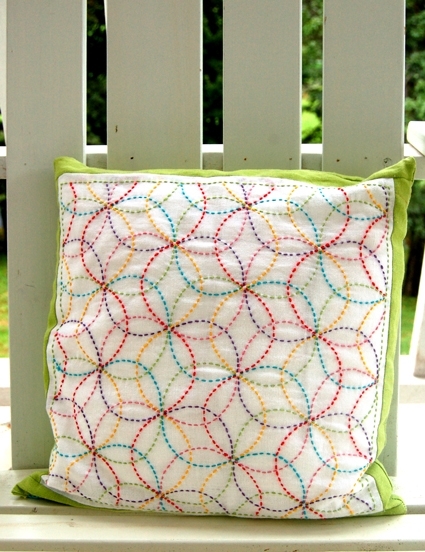 After seeing Grumperina’s pillow, or makings of a pillow, I’m inclined to pick up embroidery again and do this project. Would you say I can replace the Sashiko thread with DMC floss? I have lots of those from when I was cross-stitching. Also One Crafty Mumma asked above how much of the Sashiko thread would be needed if one were to do this pillow in just one colour. I’d be interested in the answer. Maybe in yards, if possible. Thanks! Hi, I was wondering if you all had any ideas for transferring the sashiko pattern onto other fabric? I have beautiful tana lawn in navies and greys and I wanted to do something cool with it. Quilting the front using sashiko would be perfect I think. Thanks! Great project! I just wanted to let you know that we featured this project on our Facebook page with almost 12,000 fans. Wed love it if youd use our Featured Blogger button, available at: http://www.dailycraft.com/thank-you-for-crafting/. Our audience loved the project and we look forward to sharing more from you. Please let us know if you have any questions or projects youd love us to feature! Thanks! I cannot find the linen on your site called for in the materials section. What would be a suitable substitute? Thank you so much for writing in! 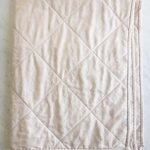 Some great substitutions for the Tencel Linen are Purl Soho’s Handkerchief Linen (https://www.purlsoho.com/fabric/by-the-yard/handkerchief-linen.html), Robert Kaufman’s Handkerchief Linen would also work (https://www.purlsoho.com/fabric/by-the-yard/handkerchief-linen-cotton.html) or Kiyohara’s Linen Blend (https://www.purlsoho.com/fabric/by-the-yard/linen-blend-solids.html). Again, thank you so much for your question!